Hail storm/flash flood in Cache Creek on May 23. 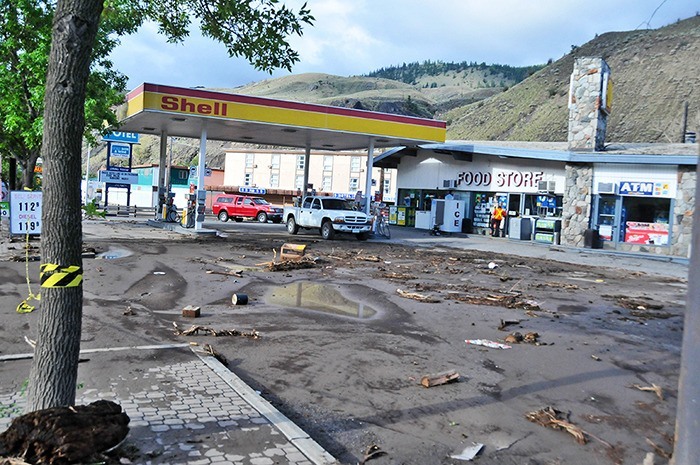 Businesses like the Shell station had mud and debris to clean up. Rain and hail force dozens to leave their homes; still more with water damage. Torrents undercut main road. May. 24, 2015 5:00 p.m.
It’s usually brushfires that worry residents in Cache Creek at this time of year, but Saturday evening an hour-long storm of rain, hail, thunder and lightning unleashed 20 mm of rain over the town. Hail fell from the sky while water coursed down the surrounding hillsides and then streets, etching new pathways and leaving a path of muddy destruction. No injuries, but at least three residences moved off of their foundations and left uninhabitable, one trailer park evacuated, 50-60 people from about 30 houses had to spend the night elsewhere. Several other homes, the school and at least one business with water damage, mostly to basements. Storm-caused torrents undercut a large part of Stage Rd. and several driveways.